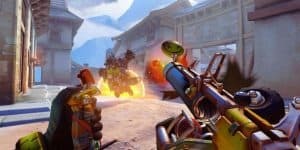 New Overwatch Game Mode: 6v6 Lockout Elimination | Nerd Much? With Overwatch‘s Anniversary event coming to a close, Blizzard has finally added that new game mode that has been rumored for so long. Based on the 3v3 Lockout Elimination mode that occurred during the event, 6v6 Lockout Elimination has replaced it. As the name implies, you get only one life per round. However the twist comes that if your teams wins the round, you won’t be able to use those heroes again. Meaning after every round, six heroes are removed from the roster. This encourages players to diversify their gameplay and go way out of their comfort zone. A good thing, of course, what’s more fun and exhilarating than trying something new? In addition, one should keep in mind Jeff Kaplan’s advice on the forums: “Don’t use up those healers too fast.” Better hang on to your Mercy, Ana, Lúcio, Symmetra, and Zenyatta, and use them wisely. Some of these characters might not be favorites, which makes this mode even more interesting if you need to learn how to deal with a character’s abilities you’re not impressed with. Strategy makes itself known in this mode to be sure, especially with the significantly smaller maps used. There’s no hiding from enemies here, as a capture point forces each team to the center of the map. No sniping for me anymore, it seems. Unfortunately, this new mode means that some others are removed to make way for it. No Limits and Capture the Flag are gone from the Arcade now, but if you miss them terribly you can still create your own lobby with similar rules.